Previously, there was an add-on made to count stone and elixir. But it was irregular and not so comprehensive. It will be useful for Titan slots. Daha önce stone ve elixir saymak için yapılmış bir eklenti mevcuttu. Fakat düzensiz ve bu kadar kapsamlı değildi. Titan slotları için kullanışlı olacaktır. I’m thinking of adding these values to the plugin. But can you help with the codes? To figure out how much gold you picked up you’ll have to keep track of when the bot was started and the amount you started with then subtract them. OK. Thanks. That’s enough for this plugin then. 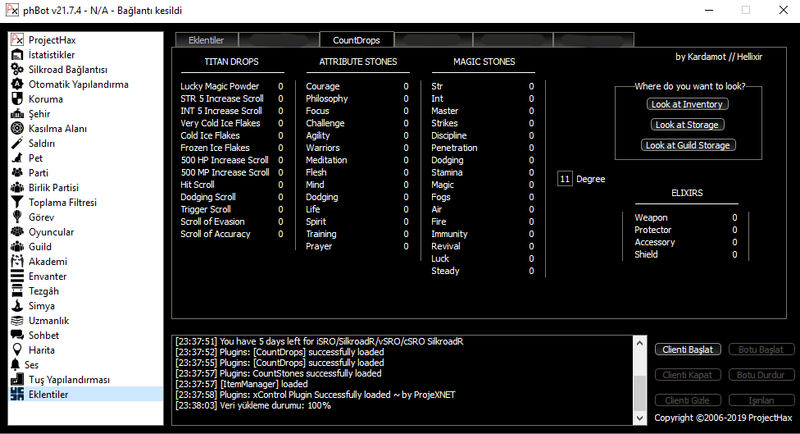 I’ve added a list for attribute and magic stones. Would be better just a (combo)box or a list(view) with unique(not repeated) items from inventory > Select > Count. Easier & Flexible : Design perfection. That won’t work due to the indentation. Use code tags or put it on GitHub.